If you think LinkedIn doesn’t matter for your business, here’s why you’re wrong. Our host for this episode is Kyla O’Connell, Senior Partner and Sales Facilitator at Asher Strategies. Kyla’s guest is Judy Schramm, CEO of ProResource, a marketing agency that specializes in executive branding. Topics covered during the program will include some myths about LinkedIn, common mistakes that are made, and the bare minimum every professional needs to have on their LinkedIn profiles. 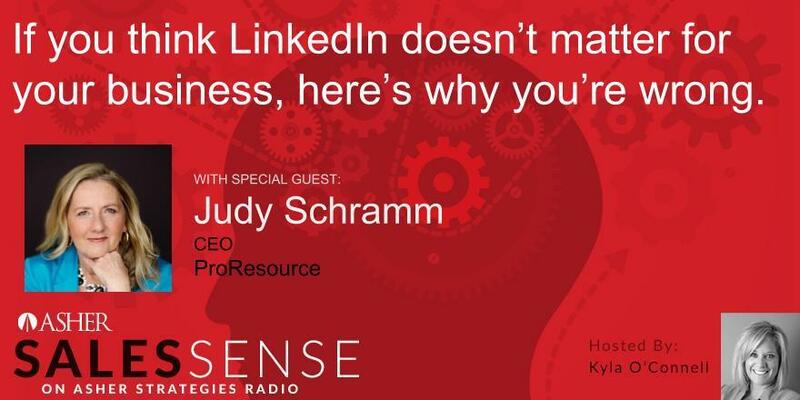 Judy Schramm is the CEO of ProResource, a social media agency that helps CEOs and thought leaders create a strong personal presence online and use social media to advance their business goals. The company has a unique methodology for personal branding that focuses on sharing thought leadership, building an audience, and moving people to action, so clients can grow their businesses faster and make a bigger dent in the universe. Schramm’s network includes more than 14,000 followers on LinkedIn and 4000 on Twitter. She blogs, speaks often at industry events, has written an ebook and many articles.